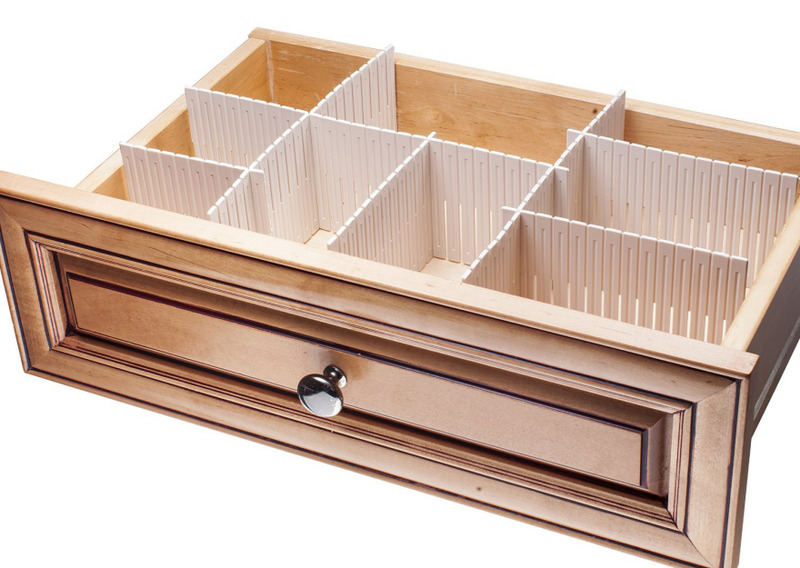 Anyone who's tried to find one specific item in a large, crowded drawer will appreciate how drawer organizers can help make things easier. DrawerDecor from KMN Home is one cool way to provide that organization, with a silicone mat (which can be trimmed to fit) and repositionable pieces. It's easy to install and easy to clean—and it makes it extremely easy to find things. It can be configured as needed by each end user. However, not everyone has enough drawer space for this approach. The Dream Drawer Organizers from Dial are spring-loaded, so they're easy to install—no tools required. 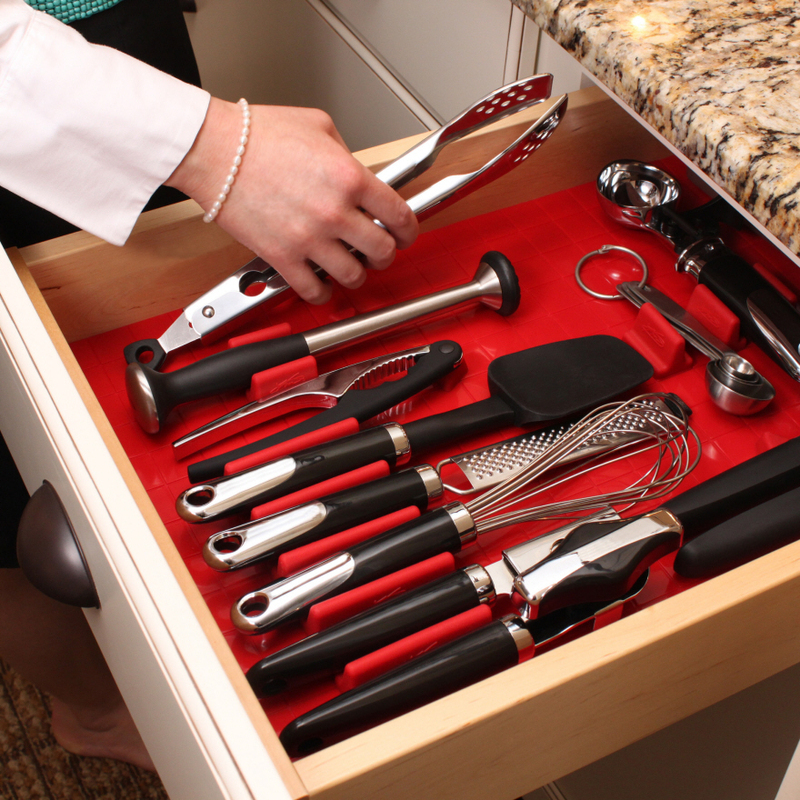 They come in two sizes to accommodate different drawer sizes. 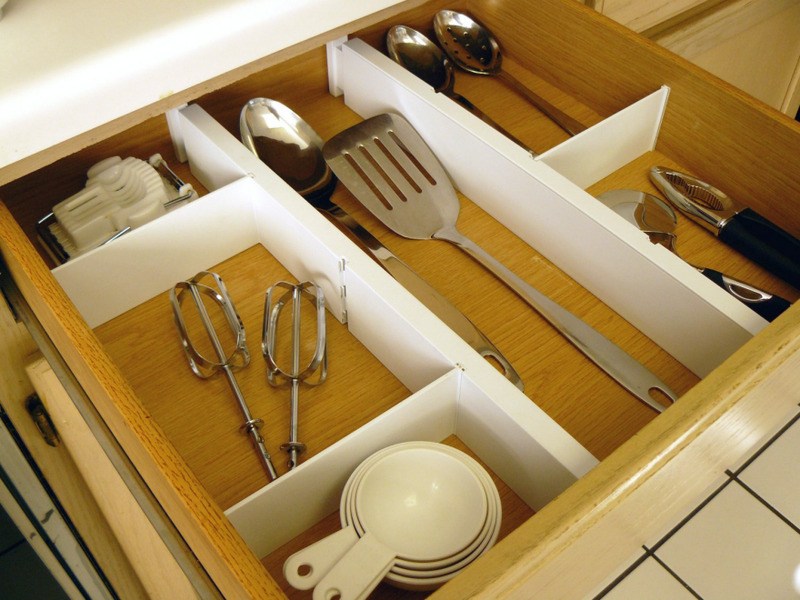 These organizers subdivided the drawers while still allowing a group of kitchen tools, for example, to overlap. One concern: A number of purchasers have complained that while the taller-but-shorter dividers are supposed to expand from 12 inches to 18 inches, they didn't actually compress to 12 inches, and therefore didn't fit into some shorter drawers. 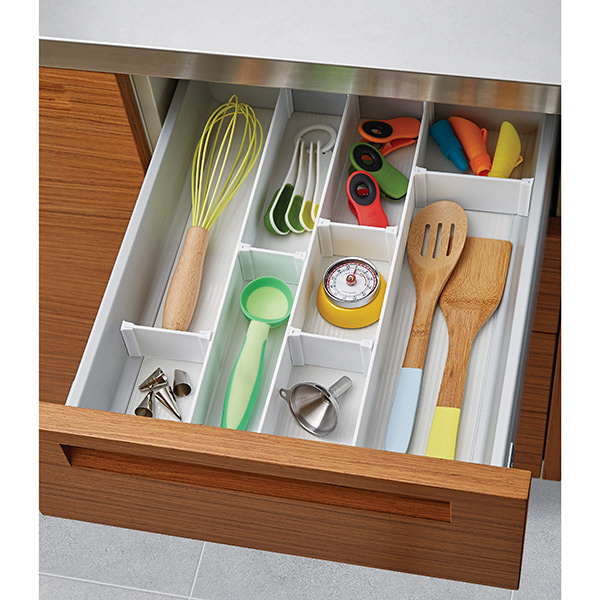 The expandable drawer organizers from Axis are also spring-loaded. One added feature are the notches which allow for horizontal pieces to be added to subdivide the rows into smaller sections—a nice option. However, purchasers noted these dividers, like the Dream Drawer Organizers, didn't fit drawers on the shorter side of the given range. And one purchaser had a drawer destroyed when the compressed spring let loose. 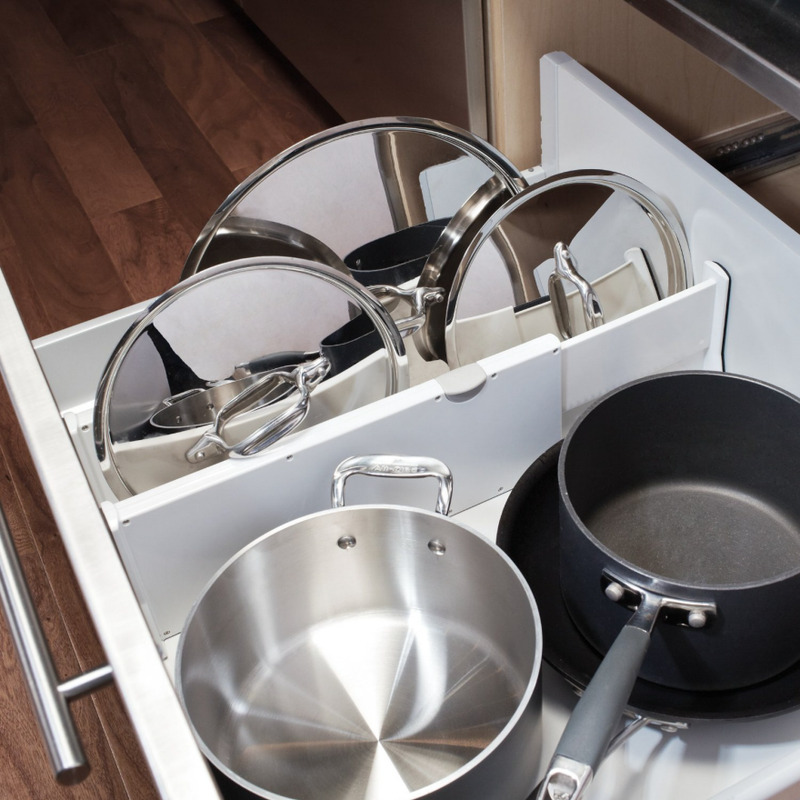 The OXO drawer dividers come in two sizes; they provide the same ease of installation as the spring-loaded drawers, but use a different mechanism. 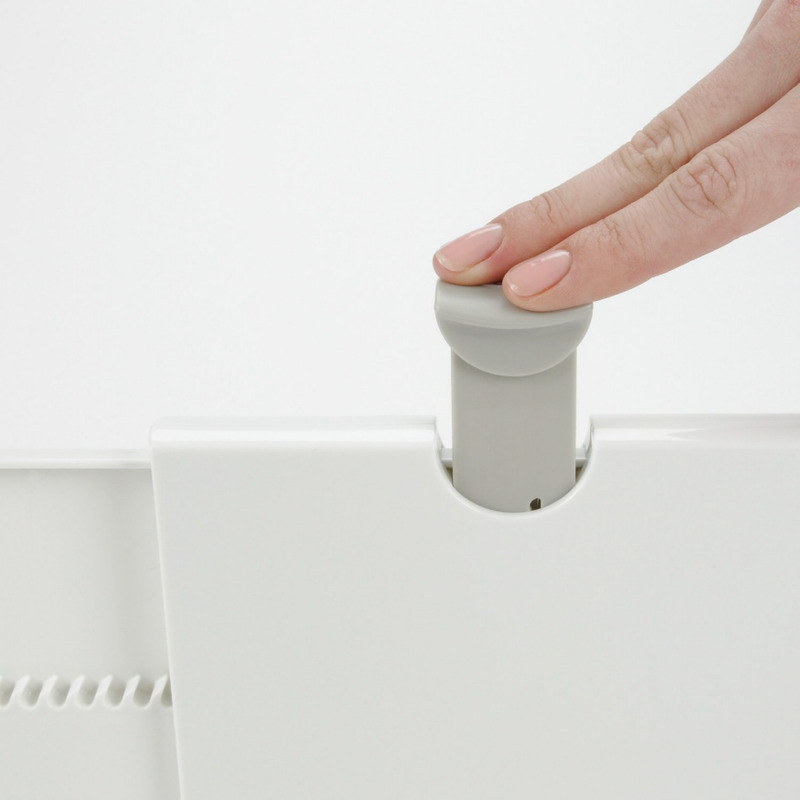 The end user pushes down on a button to expand the organizer to fit the drawer. However, a minority of purchasers have reported problems with the dividers staying in place. The slotted interlocking drawer dividers from Sorbus are also easy to install and configurable to the end user's needs. Each set has three strips that snap apart without the need for any tools. Using these dividers will require the end user to do some pre-planning and measuring, though, to get the configuration right before snapping the strips into pieces. That may sound trivial, but for some end users it will be a challenge. 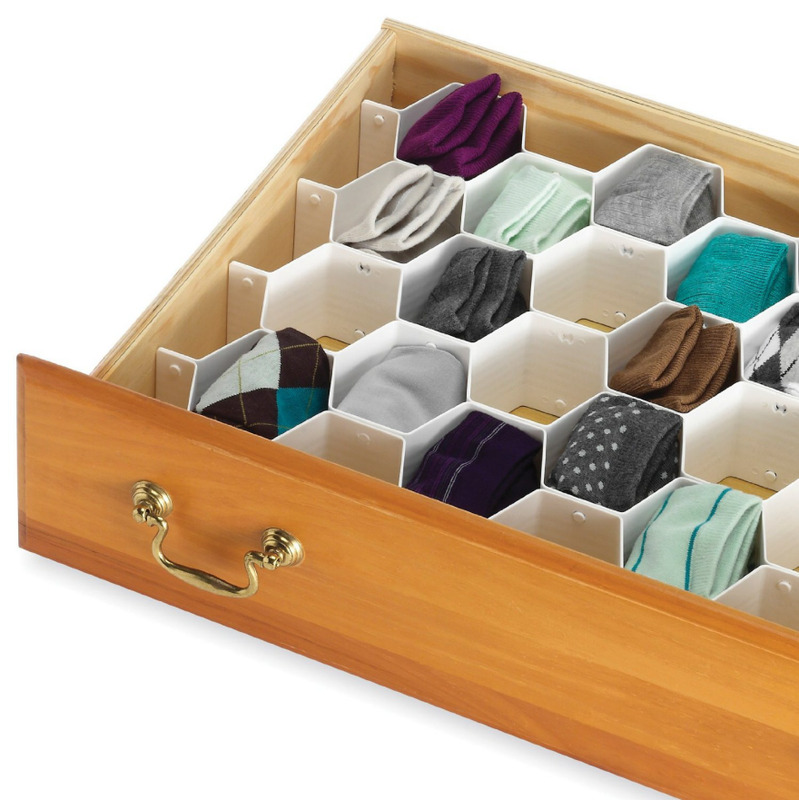 The custom drawer organizer strips are another fully-configurable design. As The Container Store says, "You just measure, score, and snap dividers to the length you need; then slide them into the self-adhesive mounts in whatever configuration you want." However, some purchasers found the "score and snap" part to be somewhat difficult. The deep drawer inserts and the kitchenware and plate organizers from Häfele use a base plate and posts. 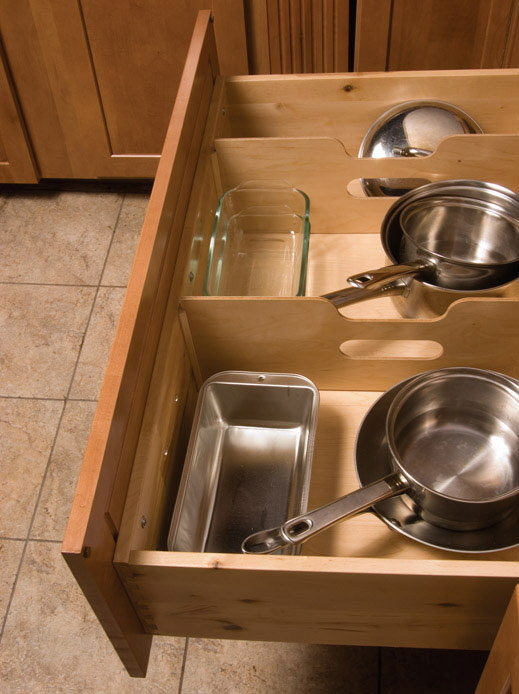 This seems like an effective way to store plates in a drawer, but no one I've worked with would care about organizing pans that way, especially since it would seem to reduce the number of pans that could fit in the drawer. 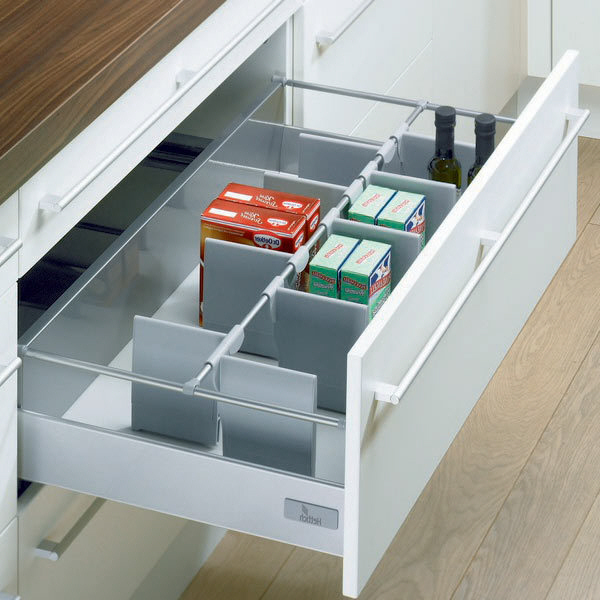 The Hettich Orgastore 100 kitchen drawer storage set, designed specifically for Innotech drawer systems, uses yet another configurable approach: a rail system with dividers. Some drawer organizers are designed to meet a very specific need. 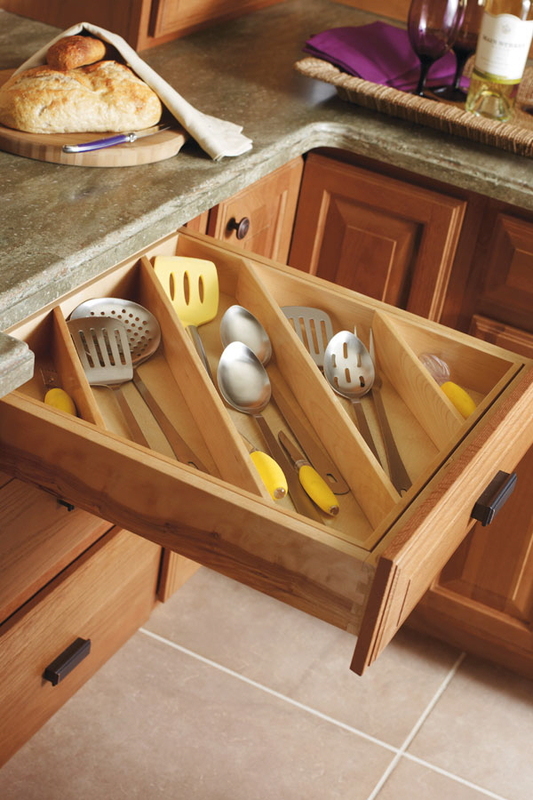 That's the case with the diagonal cooking utensil divider from Diamond Cabinets, which gives the end user space for large utensils that might not fit in a drawer with standard dividers.